Computer glasses are specialized eyeglasses made especially to handle the unique visual needs of extended computer and smartphone use. To address these requirements, computer glasses are made in completely differently, in a few crucial ways, from run of the mill eyeglasses and reading glasses. These important differences are what make computer glasses so critical for maintaining both your visual comfort and health as we exist in a world greatly influenced by computers and smartphones. To start understanding the benefits of computer glasses, it is worth noting that computer screens are generally positioned about 20-26 inches from your eyes. This is what eyecare professionals refer to as your “intermediate” zone of vision. In contrast, traditional eyeglasses are not manufactured in a similar way that is meant for intermediate viewing of the type required by computer work. 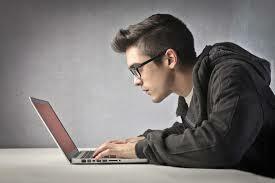 This typically leads to hazy vision, eyestrain and headaches after extended computer use. Computer glasses, in contrast, are intentionally made to accentuate intermediate viewing, assisting your eyes to more easily focus on the computer screen with minimal effort and making computer viewing over a longer period of time a lot more comfortable. For those of us who are in front of the computer for extended periods of time, it’s important to understand another factor that often leads to computer related discomfort and could be possibly sight-threatening: blue light. This high-energy light is emitted from computer screens, televisions and smartphones, and can cause eyestrain, headaches and fatigue. Recent research also points to increasing evidence that blue light exposure can greatly increase a person’s risk of macular degeneration in the future. Computer glasses are typically equipped with special coatings or lenses that are made especially to filter harmful blue light, so that it does not effect your eyes. This makes long term computer use more comfortable and reduces the risk of developing macular degeneration in the future.For more on how computer glasses can help you, speak to your Berryessa Optometry eye doctor today!